The most common example of balancing a game in Gamestar Mechanic is balancing its difficulty: Don’t make the game so easy that it’s boring, and don’t make it so hard that it’s frustrating. To tweak the difficulty of your game, you must be able to make small changes to it without becoming too attached to certain details. Remove enemies, adjust the player’s health, and redesign unbalanced areas, for example, until your game is more moderate in challenge. You are the creator of the game, and the creator often finds the game easier to play than others do. Don’t make the game so difficult to complete that even you can just barely beat it. If lots of people leave reviews saying that your game is too difficult, think about whether you should make it easier, and consider how difficult you want it to be. Also keep in mind that Gamestar Mechanic users have varying skill levels. There isn’t a specific level of difficulty that all games should strive for because the difficulty of a game is relative: A beginner may find a game very challenging, while an expert may find the same game easy. Balancing a game for inexperienced players is therefore a different sort of goal than balancing one for experienced players. Add or remove challenges. Delete or add a few enemies, or open or close gaps in the floor for the avatar to jump over, for example. Move a key health pack a little farther out of reach, or make it a bit easier to obtain. If any challenge seems to be too little or too much, balance it with more or fewer complications. Change the health, speed, fire rate, and other qualities of enemies. Make motion blocks move slower or faster. Change the widths of platforms to make them easier or harder to jump across. Calibrate each challenge you give the avatar so that it’s not too easy or hard. Modify the avatar’s abilities. Change the avatar’s speed or health. Adjust the level’s gravity to change its jump height. Grant abilities such as phasing or shielding to make some areas easier. This strategy is a useful way to change the difficulty of a setting if you’re hesitant to change the rest of your level. 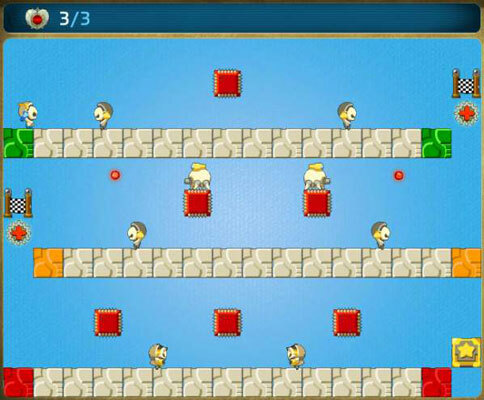 Here is a game with several levels of difficulty. It consists of three horizontal passages, from easy (top) to hard (bottom). Note how the middle passage achieves a balance between the two: The game space is tighter than above but looser than below, and the enemies combine elements from both of the other floors. The game as a whole is balanced because the difficulty ramps up steadily, with each floor tuned for a certain player skill level. If you want to earn the apprentice badge for your account, you must be able to design a game with three levels, each tuned to a different difficulty. You can use Episode 5 of the Addison Joins the League quest for more practice with balancing games.